My wife and I were hoping to get some information from you all great forum posters and readers! 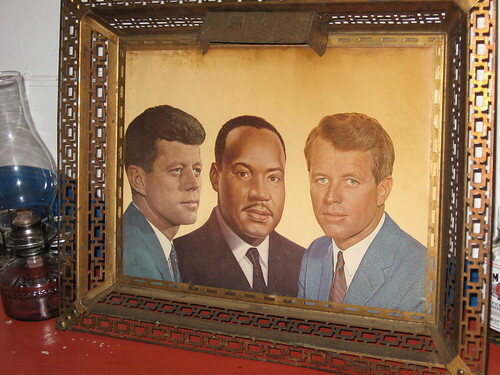 We recently had the extreme good luck to have found an original Immortal Americans (MLK, JFK, RFK) portrait in the original metal frame...it even has the original working light! Breathtaking! A relic of past history that is still very relevant today. Since I have seen the very same item overlooking the shop in Forestville, I was wondering if Miss Cat would be so graceful as to hip me to any information on the portrait. If anyone knows where they were made, who sold them, if they were mainly in shops (i.e. barbershops, candle shops, etc) or in private homes, year they were made??? Thanks to anyone with any information! I am thrilled to have the "three wise men" looking out on my home and reminding me what really matters! Yes, we have this in our shop... but i do not know who made them. They were found everywhere when i was young -- in barbershops, shoe shine parlors, candle and conjure shops, and also in private homes, to a lesser extent. They were, in their own way, a sort of coded announcement -- "We serve people of all races in this shop." I can tell you a funny story about this picture that was told to me by a man who came to the shop and saw our picture. He was an African American French Creole man from central Louisiana. His uncle was a famous traiteur and root doctor. He was drafted into the army during the Vietnam war. He served in Viet Nam and after a while received a furlough to go home to see his folks in Louisiana. He overstayed his time and was late making a start back to California, where he was supposed to rejoin his army group for transport back to Viet Nam. His folks found an old car to loan or give him, with the hope that it would hold up long enough to get him to Oakland, California, but the car broke down in Houston and he was stranded by the side of the road. He decided to hitch-hike, which was a dangerous mode of travel for a Black man back in the South in those days, but he had no choice. The first vehicle that stopped was driven by a Mexican man who spoke almost no English. He had never met or seen a Mexican man before and was frightened when the man indicated that he should get in the car and that he would take him to his home for dinner and a bed and that they would fix the car in the morning. He really believed that this Mexican man might kill him, but he couldn't stay out on the road either, so he got in the vehicle. When they got to the Mexican man's house, the man invited him into the living room and there was the "Immortal Americans" picture hanging over the mantel. The man gestured to the picture and said, "Kennedy and King." "I knew i was safe, then," he said. The man's wife cooked him dinner, the man helped fix his car, and he made it back to Oakland just in time to get shipped back to Viet Nam. That is a beautiful story and a wonderful reply! Thank you so much for taking the time to share that with us! We will treasure the portrait always! Great story, Cat. And a wonderful find for you, Joseph! Pure Americana. Fantastic. Thank you Ellis! It gives me great comfort to see the portrait in the house each day! A real personal find for me.